Based on the character from the Pixar film "Toy Story," this ride at Disneyland is a bit like being inside a giant video game. Riders shoot at targets and score points, with one controlling the vehicle and both "blasting" away. The storyline comes from the beloved Pixar animated film and your mission is to help Buzz Lightyear defeat Evil Emperor Zurg who is stealing batteries from helpless toys to power a new weapon of destruction. 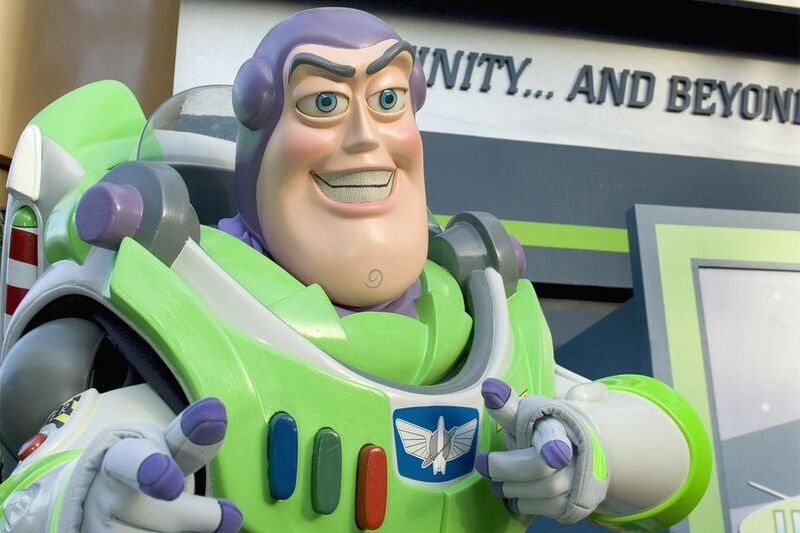 We polled 247 of our readers to find out what they think about Buzz Lightyear. 84% of them said It's a must-do or ride it if you have time. Location: Buzz Lightyear is in Tomorrowland. Restrictions: No height restrictions. Children under age 7 years must be accompanied by a person age 14 years or older. Recommended for: Families with teens or preteens. It's fun even if you don't normally play video games. Accessibility: Everyone enters this ride through the same entrance. You have to transfer from your ECV into a wheelchair to get inside. From any wheelchair, people must transfer to the ride by themselves or with the help of traveling companions. If you stopped at Guest Relations to pick up a handheld captioning receiver, you can use it here. You can use one of two strategies to score the most points. Some people want to take aim and try to get a high hit percentage. They can pay more attention to that than to their score. Or you can blast away as fast as you can and don't bother to take careful aim. Hit this target worth 50,000 points and kill your competitors in one shot: In the second room where Zurg stands and turns, look got a small “Z” on his chest that does not look like the other targets. It can be very difficult to hit (even if it looks like you squarely got it), and players say it only registers about half the time, but it may be worth the risk. You can make your vehicle spin, using the joystick in the middle. A sneaky spin is a good way to throw your companion away from their target. It may just be our bad luck, but this ride seems to break down a lot although not as much as it did a few years ago. Ride it when you find it open. If you visited Disneyland from the 1950s through the 1980s, this building housed a series of film experiences, showing scenes of America and the West. The structure at one time was the line queue for the short-lived ride Rocket Rods. Some considered it plagued with technical problems, being closed more often than open. Is It Different Than Buzz Lightyear in Florida? This ride is nearly identical in both parks, and you could easily skip it in California.